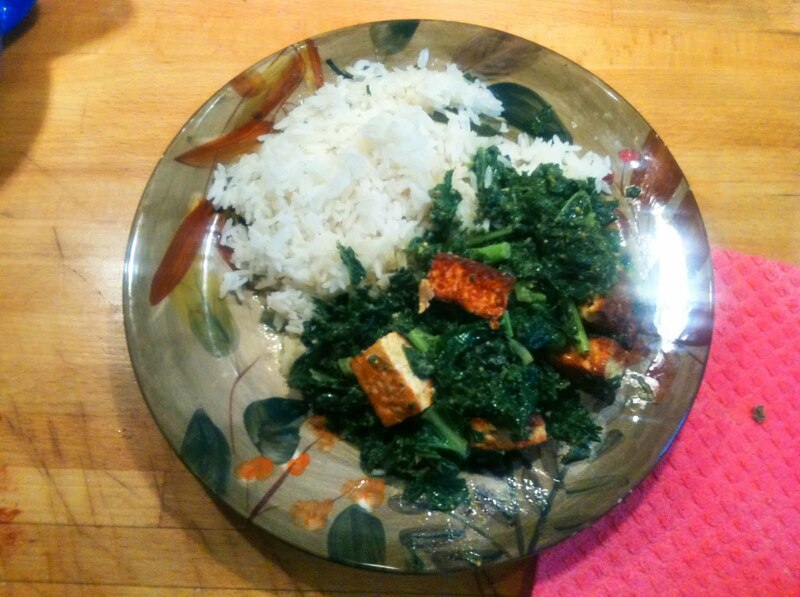 Another dish i have been making quite a bit recently is Saag Paneer. This is an Indian dish most commonly made with spinach, but can also be made with a variety of other Greens. I have experimented with many of these greens, but have to say that my favorite is to make it with a mixture of Kale, and Spinach. 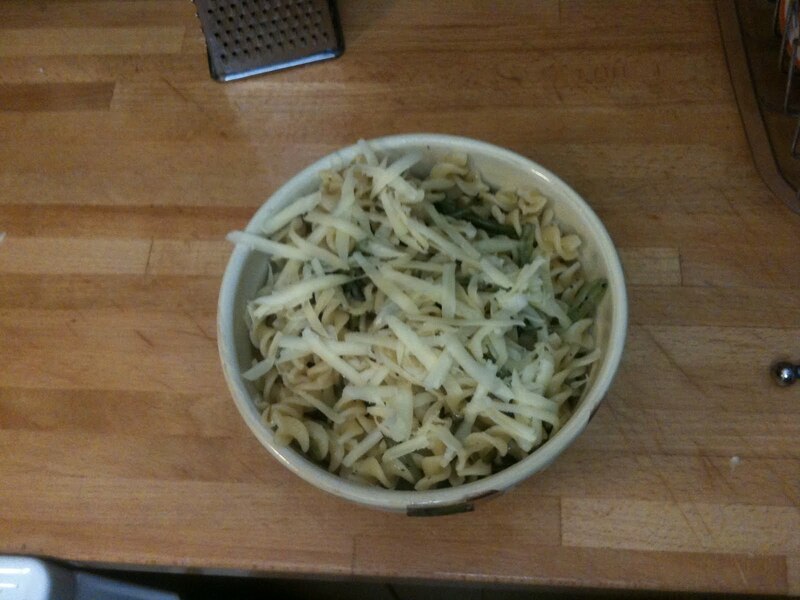 So this dish is very easy once you get the hang of it, but it requires very good Mis-en-Place. which means have everything ready and organized before you start cooking as it all happens very fast, and there are lots of spices! it helps if you use some ramekins, or some other little bowls. 1. In one bowl, put the cumin and mustard seeds, along with the grated garlic. 2. In a second bowl, put the coriander powder, the ground ginger, and the nutmeg. 3. In a third bowl, put the sugar, the salt, and the grated FRESH ginger. ok so that’s enough organizing. now for the cooking. First! heat up the ghee in a pan, and add the paneer to it. fry the paneer until it is nicely browned on all sides. it can burn quickly so don’t let that happen. once its finished cooking, strain it and put it aside in a bowl. 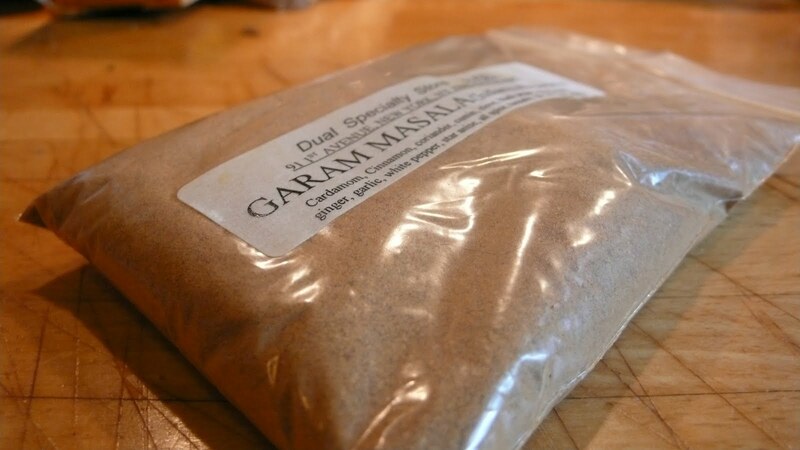 sprinkle the Garam Masala over the paneer while it is nice and hot. Second! with the leftover ghee that should still be in the pan from the paneer, cook the spinach and the kale, until it is just wilted. this will not take very long. put all of this into a colander and let it sit. Now is time to cook the spices. and where all our organizing comes into play. 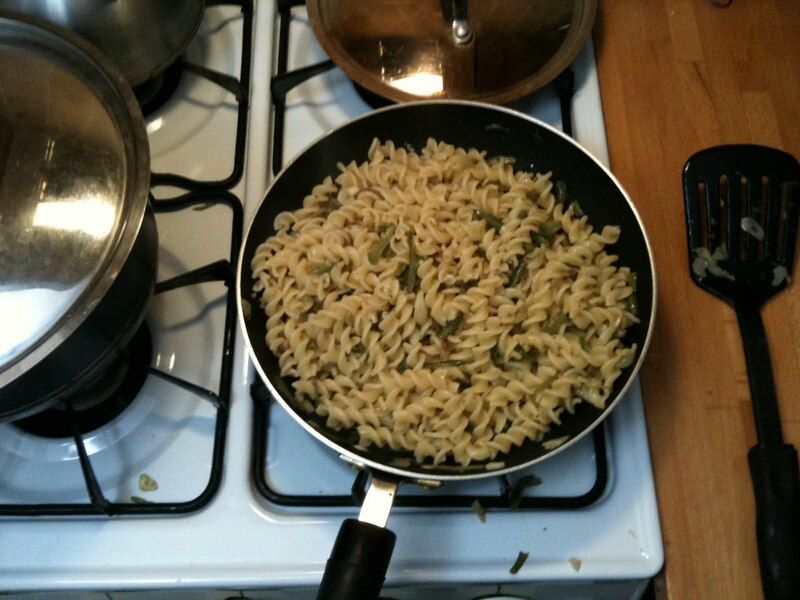 put the 2 tbspns of oil into the pan and heat it up. throw the first bowl in (the cumin and mustard seeds, with the garlic) cook it for about 10 seconds, or until the seeds start sputtering. Then! throw the Second bowl in – the ground coriander, ginger and nutmeg. and cook that for about 10 seconds also. you will have a spice goop that is very hot now. quickly throw the cooked greens back into the spices, and toss around until the spices are even spread around. cook this for about 2 or 3 minutes. Then add the cooked Paneer, along with the Third bowl – with the sugar, the salt, and the FRESH ginger. cook all this for about 2 or 3 minutes, and Finally add in the milk (or Cream, or Almond milk, whichever route you choose to go) cook for a further 2 minutes, and then its done! the other day (actually a couple of weeks ago… this post got lost somehow) i made a pea souffle with my newly learned knowledge of making souffle. apparently souffle’s are very easy to make! all you need is to make a bechamel, and egg whites, with whatever filling you want! pepper jack cheese (grated) you could use cheddar, or any other cheese of your own fancy. Next! i made my béchamel. that’s pretty easy. first you melt the butter. then you add the flour to the butter, and mix it together. then you add the milk stirring constantly. when it comes to a boil it should be a pretty thick mixture. yum yum! this is an important base to lots of different recipes. i like to add a little nutmeg for flavor. after it was done i mixed the pea purée into the béchamel. then i took my egg whites and whipped them up until they were nice and stiff. after that i took the egg whites and folded the béchamel purée mixture together. really really fold these! no mixing! you must keep the fluffiness of the egg whites or it won’t work! after that i filled some ramequins half way, then put a nice little bit of cheese into each one, and filled them up to the top with more of the mixture. and then a nice coating of cheese on top! into the oven, and cook them until they have puffed up and gone nice and golden brown on top! Here is a great easy recipe for some breakfast Taco’s that I made one day. i made this out of leftovers in my fridge. i sauteed the onions and garlic, until they were translucent. mean while in the oven i turned on my broiler, and i roasted the tomato, the red pepper, and the corn until they got a nice charring on the skin. then i chopped them all up finely and added them to the onions, and cooked for 5-10 minutes. i added some salt and pepper, some cumin and some paprika for flavoring. voila! 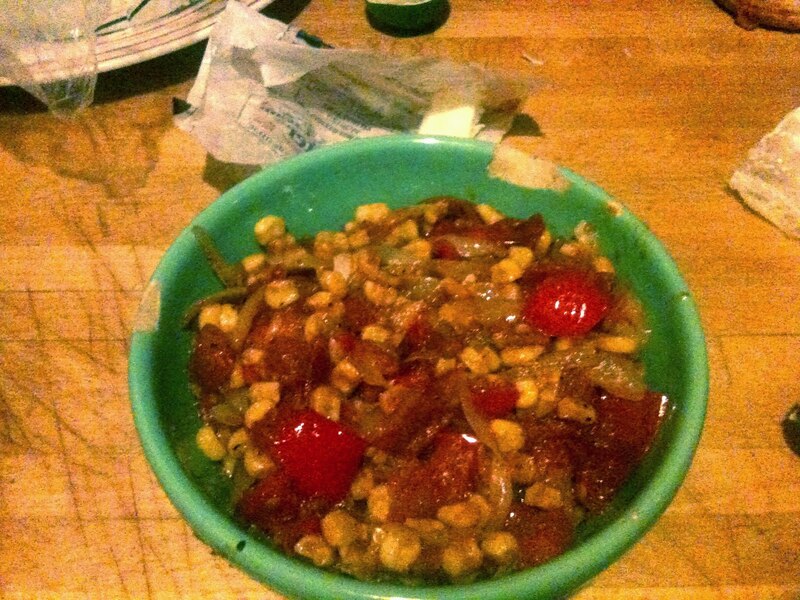 corn salsa! crack 2-3 eggs in a bowl. and salt and pepper. stir well with a fork. heat pan on med – low heat. melt butter in a pan. pour eggs in. stir them while they cook, until they are almost done. turn off the stove. they will keep cooking, so turn off the stove right before they look done. serve immediately! now you know!! so anyways, heat up the tortillas. if you put them in a paper towel and microwave for 20 seconds they will be nice and warm. or else you can warm them in a pan. next! put some of that delicious Salsa on top of the eggs, and top with your favorite cheese. at the time the only cheese i had was feta. not exactly mexican but it was still delicious! Serve up these soft tacos with a napkin! they are a little messy!! So First i took the bread crumbs and mixed them with a little paprika and some parsley. 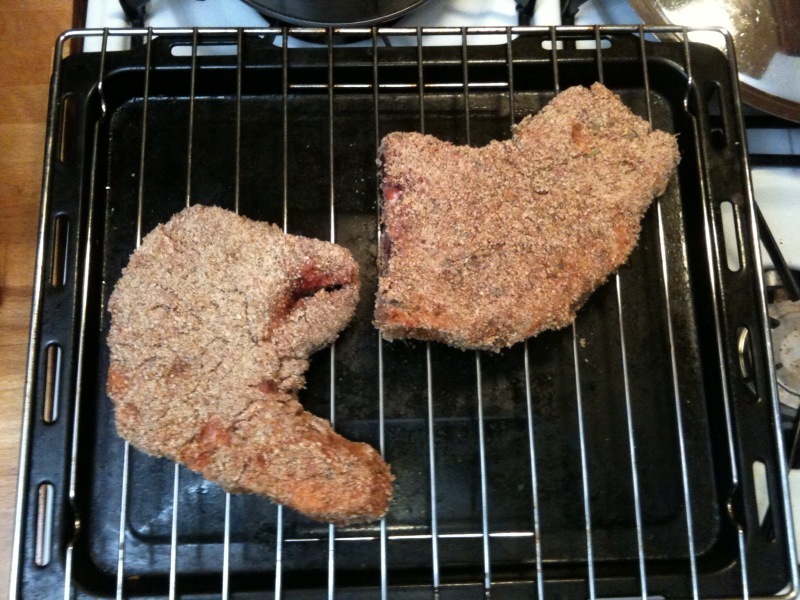 then i took the pork chops and dipped them in the egg, and then in the bread crumbs, and then because i like them extra breaded, i put them back in the egg, and then back in the bread crumbs. that’s easy right? Then i took the chops, and i heated some olive oil in a pan. i cooked them for like 1-2 minutes on each side. then i put them in the oven at 350 for another 20 minutes. i sauteed some garlic. 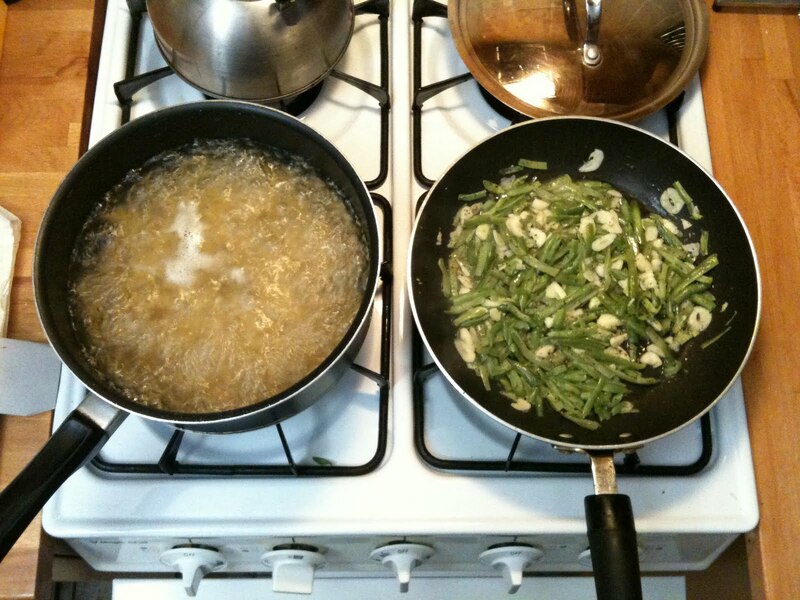 then i added the french cut beans. i let those cook for a couple minutes over low/medium heat. once they were cooked i put a little bit of flour in the pan to start a roux. i added maybe half a cup of milk, and some grated cheddar cheese. 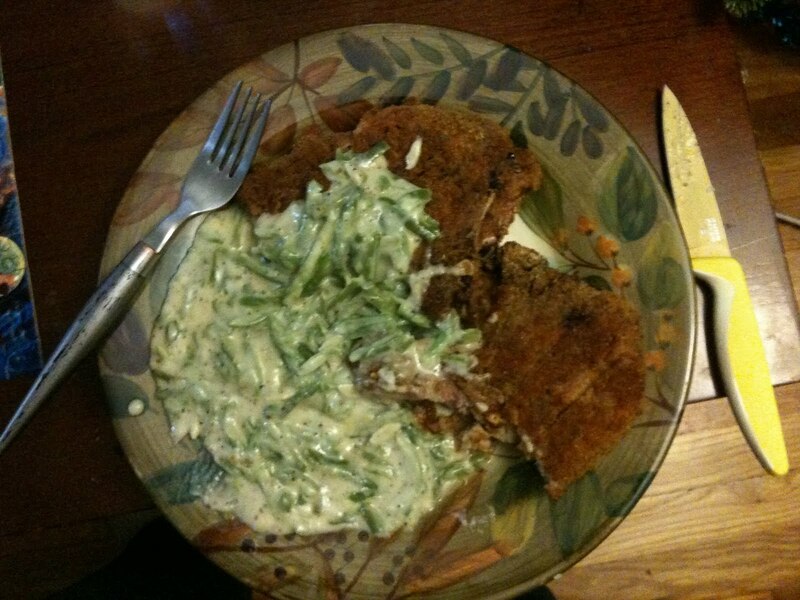 This made a nice side dish to the pork chops and added a little bit of green. heres both together! sorry for a lack of pictures this time.